An iconic sculpture will be displayed at each landing of the bridge’s shared bicycle/pedestrian path, as shown in this conceptual rendering of the Rockland Landing. The project team—in collaboration with ArtsWestchester and the Arts Council of Rockland—is inviting New York artists to create iconic sculptures for the landings of the Governor Mario M. Cuomo Bridge. 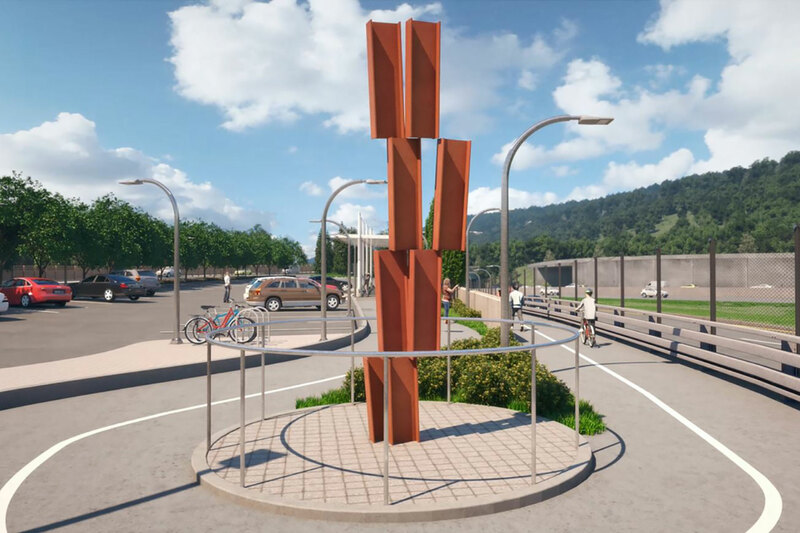 Two sculptures will be placed on New York State Thruway Authority-owned land on the Tarrytown (Westchester County) and South Nyack (Rockland County) sides of the bridge’s shared bicycle/pedestrian path in 2019. Remnant steel salvaged from the retired Tappan Zee Bridge will be made available to the two winning artists to incorporate into their sculptures. Professional New York State artists or artist collectives are invited to submit their qualifications by Jan. 11, 2019. ArtsWestchester is seeking a Request for Qualifications (RFQ), which invites artists to submit artist statements, work samples, and a project vision statement via the website: https://artswestchester.org/. A select number of artists will then be invited to submit a full proposal for their sculpture on or around Feb. 4, 2019. The Gov. Mario M. Cuomo Bridge, an iconic twin-span cable-stayed crossing that will serve the Hudson Valley for the next century, fully opened to traffic in September. Construction of a shared bicycle and walking path with six unique viewing areas has begun on the westbound span. When completed in the second half of 2019, cyclists and pedestrians will enjoy a 12-foot wide path on the northern side of the westbound span. Each of the path’s landing points will feature parking lots, bicycle repair stations, restrooms and other visitor amenities, along with connectivity to local bicycle and pedestrian networks.